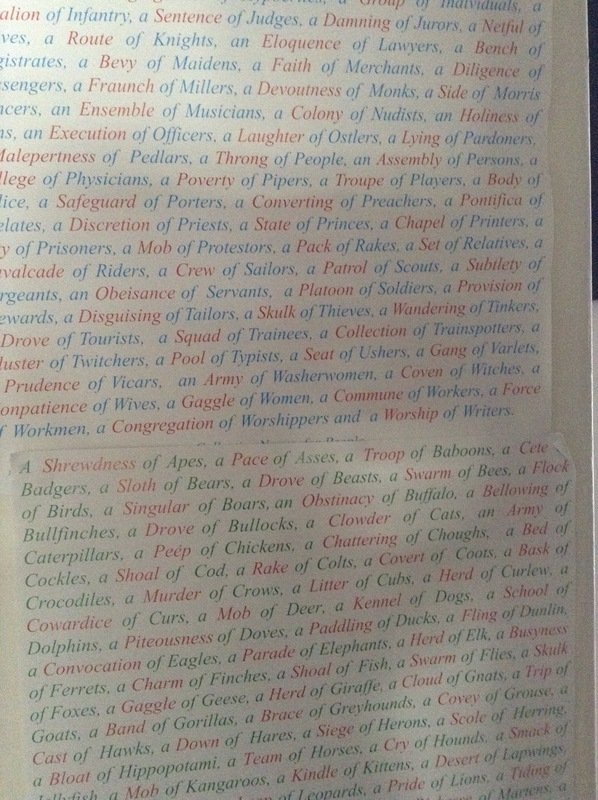 Look at this wonderful poster of ‘Collective nouns for animals, birds, fish and insects’, recorded and gathered as early as 1801! So many favourites such as a kindle of kittens, (in this case the kindle is not a computerised book) a parcel of penguins (do not wrap up a penguin and send it to anyone!) and a coat of worms (never wear a coat made from worms). You see different uses of the same word, in this case collected into groups. Fascinating! But when will we ever need to say ‘oh look a malepertness of Pedlars, or a Route of Knights!’ Q. What would happen when a pool of typists meets a worship of writers? Ans. Perhaps a marvellously good poem or a stonkingly brilliant book! This collection of words, their traditions and invention are so interesting they have been made into posters for intellectuals and word-lovers to swoon over! A swoon of poster idolisers (I made that one up, but it could work).